anyone know where the 'tell me what you know' / 'you've got to know' on tighten up tighter comes from? A record that's build on drumbreak samples with a smooth basssound to push further. It's one of those records that's at the turningpoint of becoming dubstep. I think this track was a bit of a turning point for me within drum and bass. Around this time I was still into the Hardware, DSCI4 and Virus dark sounds and this was totally different to what I had heard before. But Paradox has been around long before this was released, with releases on Good Looking, his alias 'Alaska' and in the duo's Mixrace and Dangerman & Brown. Play Twice Before Listening is the track that made me buy the 12". It has nice breaks on the intro, hard hitting and a dark, moody atmosphere which subtly drops with a simple sine bassline. But as the track builds it gets more hectic with another break (I think from the newskool funk band Breakestra), these breaks are hard hitting and still feature the original vocals which were on the break (sounds very much like James Brown). It twists and turns, the edits getting quite intense, sort of like James Brown turned up to pitch +8 and on pills if you will. Pure jungle funk (or drumfunk, if you like to use the phrase). The flipside is just as manic but probably darker, featuring the 'Tighten Up' break (also known as the tramen / firefight when combined with the amen). It is like a waterfall of beats, as if the drums are falling on you and building. As it drops the vocal whispers threateningly; 'Tell me what you know! ', classic movie sampling Paradox biz. 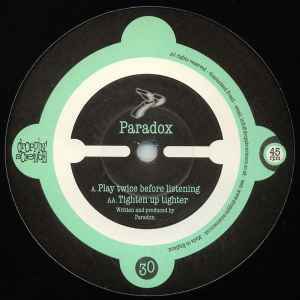 Easy one of my fave Paradox releases and first of a bit of an obsession for me.